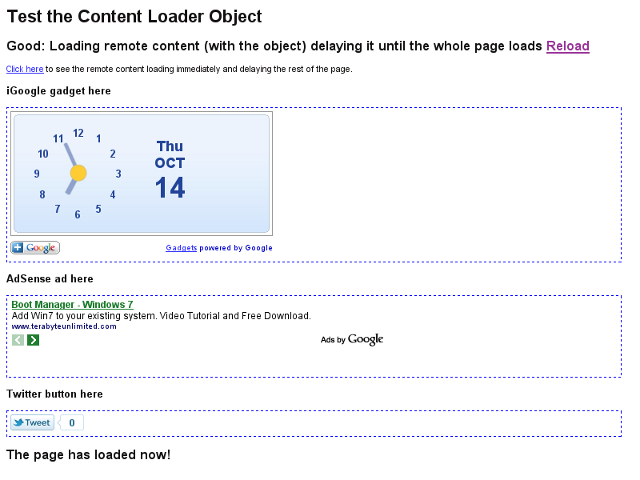 This object can be used to load remote content without delaying the loading of the rest of container Web page. It takes the HTML with tags to load remote content and delays it load until the end of the page, so the page loads much faster without delay. This object can be used to speedup the load of pages with heavy remote content such as advertising and widgets retrieved from remote sites. The order by which different page elements are loaded on the page can be configured and is independent of the position of the elements in the page. PHPSearch EnginesSearch Engine MarketingSEOOn-Page SEOComputer ProgrammingWeb DesignCascading Style Sheets Edit How can I speed my webpage load time up?